Every home gardener who takes their hobby seriously composts these days. Aside from making the perfect fertilizer, choosing to compost saves room in landfills by recycling what would otherwise be waste into a valuable, usable product. This eco-friendly practice is rapidly catching on in homes all across the United States. With more and more people choosing to make good use of things like egg shells, tea bags, and potato skins, the market has flooded with a wide variety of compost bins. While that means more individuals are practicing eco-friendly habits, it also means finding a quality bin can be a little confusing. If you’re looking to get down, dirty, and serious about your gardening, then consider the Enviro World 82 Gallon compost bin. Here’s what makes this product one lean, mean, gardener-friendly machine. 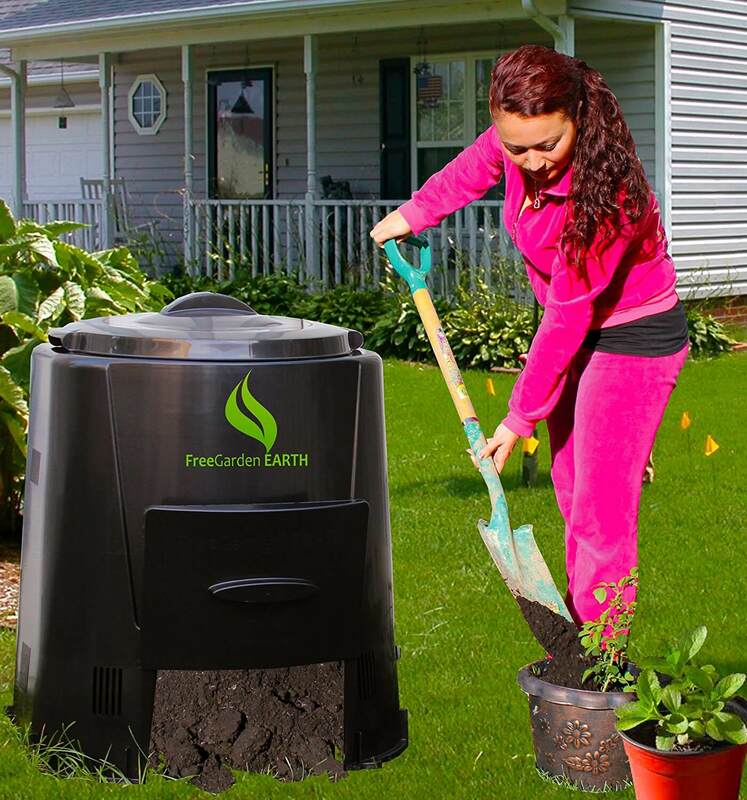 The Enviro World 82 Gallon Compost Bin is a single chamber, gargantuan-sized bin made for the serious gardener. A screw-style lid makes it easy to open and fill with waste, while the sliding door at the bottom is large enough to conveniently shovel the bi-product out. The design is incredibly simple to use. The solid construction of this device means you won’t have to burden yourself with any assembly or worry about it falling apart down the road from wear and tear on smaller parts. Entirely made of recycled materials, this eco-friendly bin is sturdy enough to withstand year-round weather conditions. While most single body designs require the use of an aeration crank, the size and ample ventilation on this model do the work for you. Vents can be found all around the bottom as well as the top which features a patented Free Garden Earth adjustable upper body. Between an amount of ventilation and the capacity, the Enviro World can turn waste into compost relatively quickly without churning or maintenance. The twist lock lid helps to keep odor at bay while also keeping any flying insects inside of the barrel and pesky critters out. 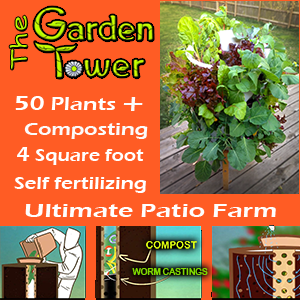 Plus, your purchase comes with a composting guide booklet to help you make the most of out of your new bin, which is perfect for anyone just getting into this hobby and looking to learn more about making their first venture a successful one. It is already pre-assembled. All you need to do is place it where you would like it and push the stakes into the ground. The size and ample ventilation make this a virtually maintenance free product, whereas other compost bins require aerator cranks or daily rotation. 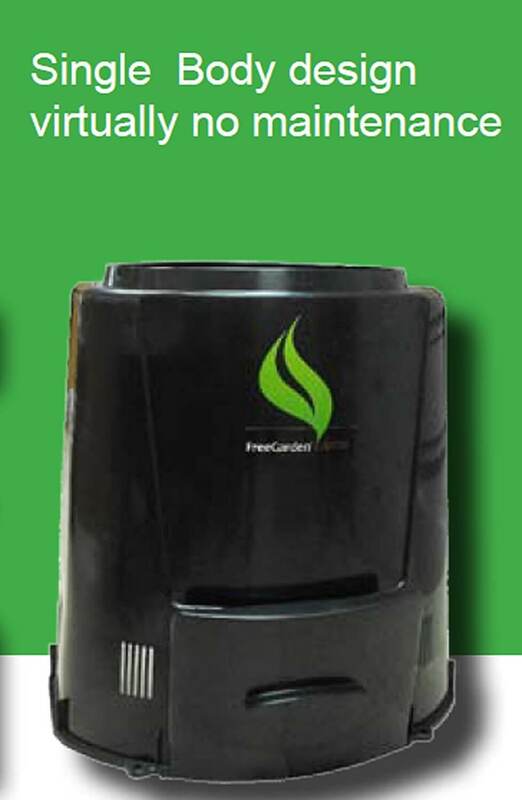 Adjustable ventilation allows for precise, fast composting. Unloading is as simple as lifting the bottom door and scooping compost out. The construction is both durable and eco-friendly. The turn screw lid keeps insects and orders in while keeping pests out. Easily drains moisture with an open bottom, while ventilation aids in evaporation. There is no bottom to this unit, which wouldn’t be a problem if rodents didn’t enjoy a free meal from your waste. Placing a metallic mesh screen underneath might be necessary to keep mice and rats away. The air vents near the ground may also provide an entry point for determined creatures who can chew through the plastic, making the use of metallic mesh screen highly recommended here as well. Is The Enviro Bin Right For Me? Anyone with significant composting needs who prefers a maintenance free bin will get plenty of use out of this one. Those looking for multi-chamber bins or who would prefer a bottom piece already installed may be better-suited seeking an alternative. Is the Enviro Bin the best product on the market? It has its advantages and disadvantages, but the good easily outweighs the bad on this device. The size alone is an eye-catching point for those with more extensive gardens or anyone with a large family that wants to start recycling their waste. The ventilation is impressive and helps to make the model maintenance free, which is a huge bonus. While you’ll probably have to install a screen on the bottom and find better stakes to keep it in place, you really won’t have to do anything once you’ve finished putting it all together. The performance is highly rated, producing enormous amounts of hot compost, and the open bottom combined with the screw locked lid keep moisture from building up inside. Adding to the moisture eliminating capabilities this device has to offer is its adjustable ventilation. The design is covered to keep rain and snow from entering the bin, while the extra vents on top help water to evaporate up and out of the container itself. Plus, the twisting lock lid seals tight to keep moisture out and odor in. This model is incredibly easy to use, but its high yield makes it an excellent choice for beginners and pros alike. If you’re looking for a way to create massive amounts of healthy compost with minimal work, then Enviro’s bin is undoubtedly worth the investment. Is it the best product on the market? Well, it could certainly use a few upgrades to put it at the top of its class. However, only having two minor, easily fixable downfalls with plenty of beneficial features makes this one of the best models out there today.